With Russia’s history, direction, and relations with the West once more under review, the time is ripe to celebrate one of the great revolutionary thinkers, one largely forgotten in his native city of Moscow. He has but a modest grave in Novodevichy Cemetery, and the square and Moscow metro station named for him are dominated by a dull statue of Friedrich Engels. Nicknamed “the gentle anarchist prince,” Kropotkin was explorer, geographer, exile, prison reformer, critic of Darwinism, idealist, and writer. Having lived in England for 28 seminal years, where he befriended and infl uenced some of the 20th century’s greatest minds, he was a model of good Anglo- Russian understanding. He wrote with equal fluency in Russian, English, and French, and deserves recognition as a significant infl uence on radical British as well as Russian thinking. Well born in 1842, Peter Kropotkin had a secure if joyless youth — very unrevolutionary. His family could trace their roots as nobles to before the Romanov era, owning large estates with 1200 serfs near Moscow. He was thus a prince, but never used nor sought advantage from the title. Kindly, hospitable, and self-effacing, he is universally described as sporting a magnificent beard (see above) and with sparkling eyes. As was common, he was sent to St. Petersburg, first as cadet and then officer. Quickly deciding that Siberia was preferable to court life, he took every chance to become an explorer, covering an incredible 80,000 kilometers, mostly on horseback and all before the railway reached the Russian east. He further found that in the remote areas he studied, isolated communities worked together and made the best of their difficult circumstances — without central direction or management by the state. These experiences inspired Kropotkin’s most famous work, Mutual Aid, which became the gospel of anarchist communism as a social model in opposition to raw capitalism. 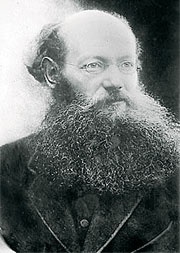 Gradually, Kropotkin became first aware and eventually a leading member of the dissident movement in Russia. His political activities earned him a sentence in a St. Petersburg prison, which ended in a spectacular and risky escape in June 1876. Prison in Switzerland and France reinforced his views on repressive authority and helped forge his belief in the need for non-violent, humane, and less centralized forms of government. His 1877 plea for decent treatment in prisons, which he called “universities of crime,” was decades ahead of its time. Like many an exile, after extensive travel across Europe, he ended up in England 1886 in the midst of radical debate across Western Europe. He moved between London, the south coast of England, and Switzerland, endlessly torn between debate in the city and clean country air for his prisonruined health. When not creating revolutionary theory, he wrote copiously, undertook technical translations, and contributed the defi nitive treatise on Anarchism for the 1911 Encyclopaedia Britannica. Given Kropotkin’s belief that brutality, unbending repression, and inhumanity were the inevitable products of a centralized state, it is no coincidence that he was most impressed with commune-based democracy in Switzerland and with the self-help and cooperative movements in England. With the advent of the Russian Revolution, Kropotkin approved of soviets as giving the masses a voice but was appalled to see them subordinated to the direction of the Party. Like most anarchists, he held that replacing one autocracy with another, monarchy or republic, solves nothing, and that progress and justice for the working people can grow only from local power, cooperation, and equality. However, since “anarchism” is a word tainted by its association with bomb throwers, it is important to emphasize that nonviolence was Kropotkin’s creed, every bit as much as it was Jesus’, Tolstoy’s, and Gandhi’s. He was equally sharp with the Bolshevik leader, saying “Lenin is not comparable to any revolutionary fi gure in history. Revolutionaries have had ideals. Lenin has none.” Never a man to tolerate antithetical views, Lenin was not amused, which may explain the absence of memorials to Kropotkin in Soviet Moscow. Still, Kropotkin’s return to Russia in June 1917 had attracted 60,000 to welcome him, far more than met Lenin at the Finland Station. Kropotkin, too, was firm to the point of rigidity in his own views. His denunciation of the affluent French left as “anarchists du salon” well pre-dates “champagne socialists” and “Islington radicals.” For a Victorian, he could be remarkably concise and pithy. He died at Dmitrov, north of Moscow, in 1921, and his funeral at Novodevichy is held to be the last great gathering of the anarchists. 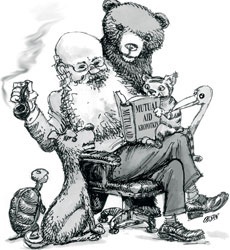 Kropotkin was a prodigious writer and thinker, developing a raft of ideas, which link to create a powerful and optimistic philosophy, a glimpse of a better world, created from below and within not imposed from above. Peter Kropotkin is honored with a blue plaque in south London. A museum to him in Dmitrov was destroyed in 1937. He deserves to be remembered better in Moscow.